Dr. Ralph J. Bunche, UN Under-Secretary for Special Political Affairs, visited Gaza in the course of routine visits to Cyprus, Gaza and Kashmir to study the problems and needs of the United Nations truce supervision and peace force operations in these areas. The missions include the United Nations Emergency Force (UNEF), the United Nations Peace-Keeping Force in Cyprus (UNFICYP) and the United Nations Military Observer Group in India and Pakistan (UNMOGIP). 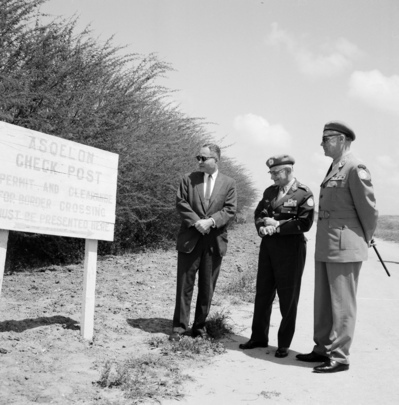 Here, Dr. Bunche (left) is seen with Major-General Carlos Flores Paiva Chaves (center), Commander of UNEF and Lieutenant-General Odd Bull, Chief of Staff of the UN Truce Supervision Organization in Palestine (UNTSO), at UNEF's Ashqelon check post near the Israeli border.